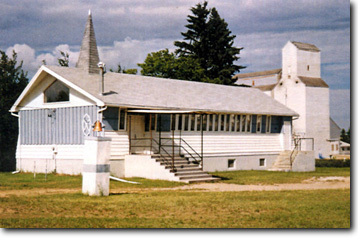 The nineteen hundreds saw many families worship in the "Birch River United Church" which had it's beginning around 1928. These were very special times and also very hard ones. A place of worship was very important to the lonely pioneers. The little white church was replaced with a larger new sanctuary in 1964. Worship services, weddings, baptisms and many special events were held there. In March of 1991 our place of worship was nearly burnt down. Everyone rallied around and with hard work and God's guidance the church was rebuilt. We again had a church for all to worship in. Our services, led by Rev. Kathy Highmoor (of 20 years), add to the meaning of life. Christmas programs, picnics with the young Sunday school children bring joy to the young and old alike. Our Pianist of forty years is Mary Sims. Her dedication has inspired us all. Bible study, confirmation classes, visitation, choirs coffee after church, special community seminars are all part of the church. Projects which help the church survive include; a Spring Smorg, Soup & Bun Luncheons, Strawberry Shortcake & Cream Puff Teas, Bake and Garage Sales and Fowl suppers. The congregation over the last 100 years has tried to work and serve within the community. We all hope that with God's help in the next 100 years there will be peace and harmony within our place of worship and in our community.